As the weaving motion of the women’s dance creates the thick rope body of the ceremonial boa constrictor snake, the point at which all the ropes come together gradually descends dangerously close to the top of Ata-Bey’s head. So the beike calls a halt to the dance and begins to pull on her end of the rope snake through the loop. As she pulls all the women allow her some slack by letting some length of rope to go forth from their individual rope coils. This causes the point where the ropes come together to rise away from the top of Ata-Bey’s head. The dance can begin again as the women continue their weaving motion to further the length of the rope snake. When the point where the ropes come together again reaches down too close to Ata Bey’s head the beike again stops the dance and again the ropes are pulled through the loop. This process continues until most of the length of the ropes have been woven into the body of the snake. Once the whole length of the snake has been created it is brought down from its loop and spread out. One end of it is tied to the belt of Ata-Bey and the women line themselves all along the length of it in a single file holding on to it with their hands. Once the participants have lined themselves up all along the length of the rope serpent The woman that plays the role of Ata-Bey is blindfolded to symbolize our helplessness as humans in the presence of the power and force of Nature. Each woman is handed a small container filled with achiote face-paint to hold in her hand as she dances. 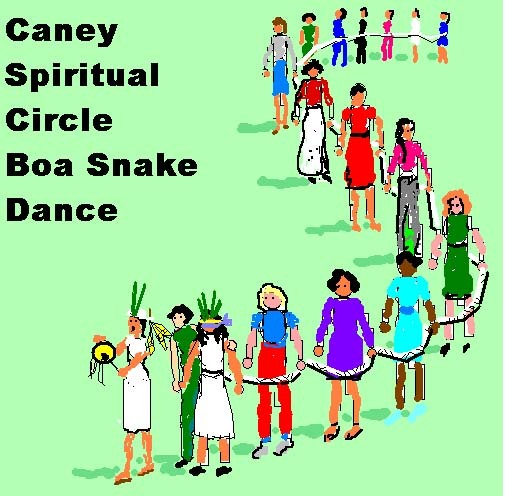 Behind the row of participants holding on the the rope snake there should be four women, each one representing one of the four directions and each one holding a basket filled with the particular food associated with her direction within our Caney tradition. These are the FOOD MOTHERS. and they represent The South with it’s green squash, the West with its black beans, the North with its white cassava loaves, and the East with its yellow grains of maize-corn. At this point the Boa Constrictor dance chant begins and the long row of women begin to dance forth from the place where they were for their women’s ritual and toward the main ceremonial center where the men await them. Resplendant in their face-paint and lined up all along the length of the rope snake they wind their way toward the men’s group led by the blindfolded Ata-Bey who is guided by two of the participants and by the beike. The beike should dance alongside the leader chanting and playing her drum or rattle all the way to the men’s group. The men should at this point form themselves into a circle facing out. When the women reach the men’s hoop, they circle around them in a line all along the rope snake. 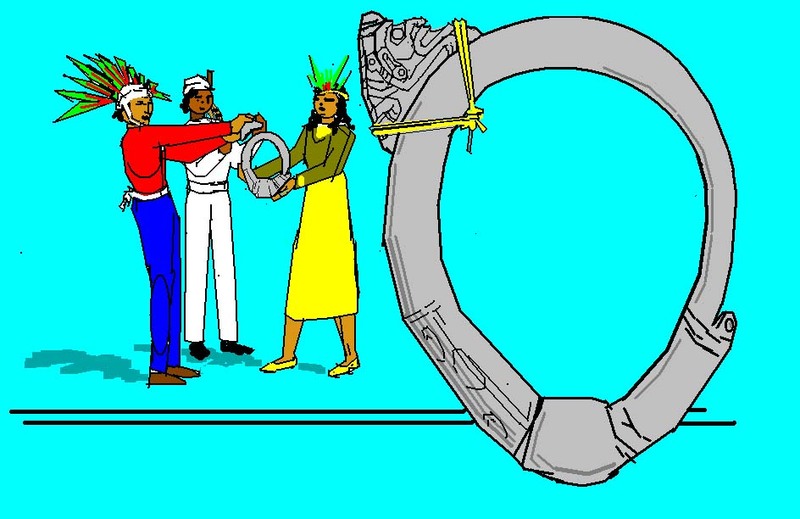 Once they have encircled the men’s hoop the rope snake is gathered up by the beike and the man designated to represent Yoka Hu takes the blindfold from Ata Bey’s eyes. The women each stands face to face with one or more men. The women then paint sacred designs on the faces of the men thereby bringing the blessing of the women’s ceremony to the male participants. If there are more men than women some of the women paint more than one man’s face. If there are more women than men then some men will allow themselves to have their faces painted by more than one woman. When all the men’s faces are painted the women and the men form one big circle and begin to dance together. After dancing together for a while the dance is stopped by the beike. During Fall Equinox the ceremony ends here. During Spring Equinox at this point in the ceremony the woman that plays tyhe role of Ata Bey is called to the center of the circle. A man is chosen to play the role of Yoka Hu and he is also asked to come to the center of the circle. At this point the beike brings into the center of the circle the ceremonial Koa hoop (stone collar). This sacred object that is formed like an oval-shaped uterus has a three-pointed cemi tied to it in the form of Yoka Hu in his dormant manifestation. That cemi was attatched to the stone collar in the Winter at Solstice-time to represent the return of the Dead Yoka Hu back to the womb of his mother twhere he could be reconceived and brought back to life. Now after months of gestation in close proximity to the sacred life-giving womb, he is ready to be born again. The beike hands the Koa-hoop to the woman that is playing the role of Ata Bey. as she holds the Koa-hoop the man that plays the role of Yoka Hu cuts or unties the cords that bind the three-pointed cemi to the Koa hoop. He takes the three-pointed image that represents the dead or dormant Yoka Hu and hands it to the beike. The beike then gives him an image of Yoka Hu that represents him as a living vigorous entity. The man that represents Yoka HU then passes the new image through the middle of the hoop as if it was being born from inside it and declarers Yoka Hu “born” everybody cheers and the dancing begins again as they take the sacred images away. This concludes the ceremony.